If you’re wondering how to fix a leaky bathtub faucet, you’ll be glad to know it’s a pretty easy job. It only takes a couple hours of your time and it will bring big savings to your wallet. The bad news? The longer you wait to repair it, the more money you’re letting go down the drain. 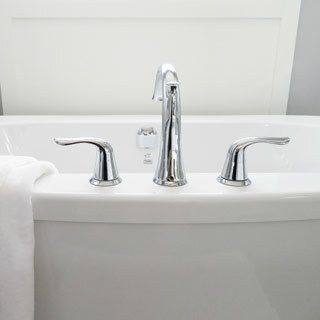 The first step is taking a look at your bathtub faucet and determining what type you have. Most bathtub faucets have the little knob at the top that you pull to turn to the shower position. That’s called the compression valve. If you have a compression-valve type faucet, here’s how to fix a leaky bathtub faucet quickly and easily. Begin by turning off the water. If you can reach the water valve for the bathroom, turn off the water there. If you can’t, then turn off the water at the main water supply — which is usually located in your basement. Be sure to open the faucet in the bathtub and let all the water run out before you get started. Take off the faucet handle and the decorative mount. Loosen up the screws on the center faucet cap and after loosening, remove the screws. Take faucet out of the wall. Replace the faucet handle and then test your new bathtub faucet. Is the leak gone? If the answer is yes, you’re done! Otherwise, if the leak still persists, then you’ll have to move next to the faucet stem. The rubber washer at the top of your faucet stem? It’s called the seat washer and it’s designed to stop any water flow. Over time, it can get hard and ineffective. If it looks hardened or worn out, you should replace the washer — or replace the entire faucet stem. Pro tip: You can remove the faucet stem and take it to your local hardware store when you’re buying the replacement to make sure you’re purchasing the right one. You’ll want to be sure to clear away any old corrosion, dried caulk, or rust before you put the new faucet stem in. The faucet stem is what’s either raised or lowered when you’re turning the handle. If it’s corroded or rusted, it could be stopping you from turning it off completely. Replacing the stem, or at least the main seat washer at the top, should solve your leaky bathtub faucet problem. Use an adjustable wrench to loosen the bolts and then remove the faucet stem. The bolts could be on the faucet stem or on the wall. Install your new faucet stem, using new bolts. Your leak should be gone now. Add new caulk around the newly installed faucet stem and around the decorative cap that is holding your faucet handle. Give caulk time to dry, which can vary from 3 to 24 hours. If you find you have the time to fix the leak yourself, it’s a pretty easy repair job. When you’re not sure about how to fix a leaky bathtub faucet or you simply don’t have the time, call PJ Fitzpatrick. PJ Fitzpatrick has been providing installation, maintenance and repair solutions to Delaware Valley homeowners for almost 40 years in the Philadelphia area, Wilmington, West Chester, Cherry Hill, and beyond. Request an estimate today, and find out what we can do for you.